A truly versatile item in the kitchen can be hard to find, but that is not the case with this unique, durable item. This 8 oz. 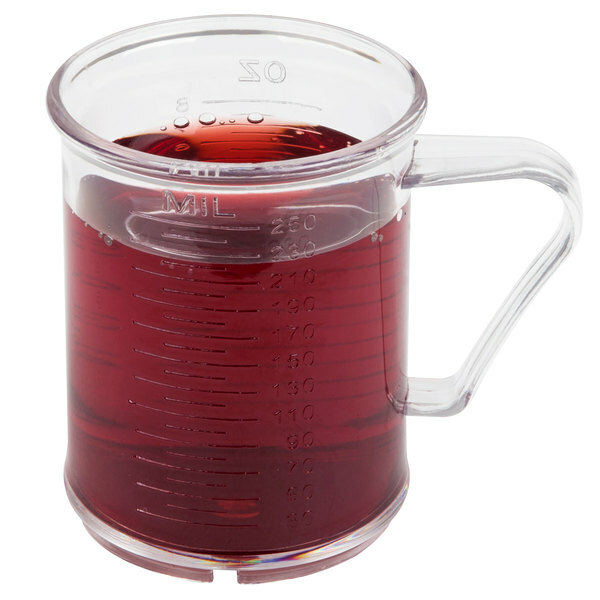 acrylic dredge/measuring cup boasts an incredible design and ease-of-use. 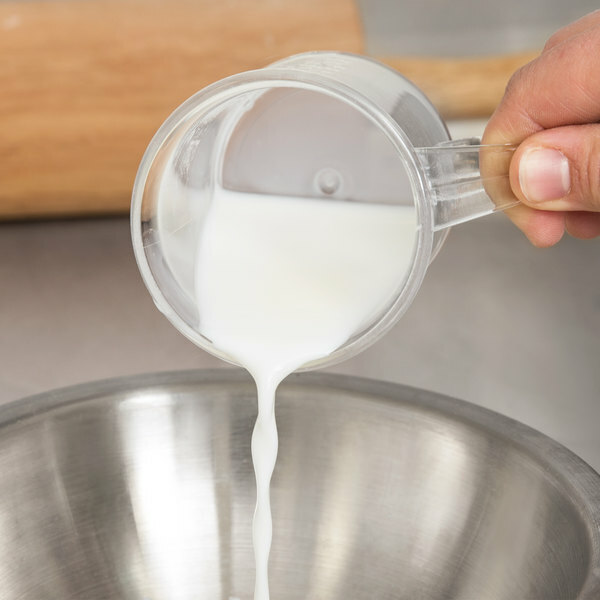 Plastic base construction is paired with three tops with varying-size holes so that the item can be used for a wide array of different ingredients. 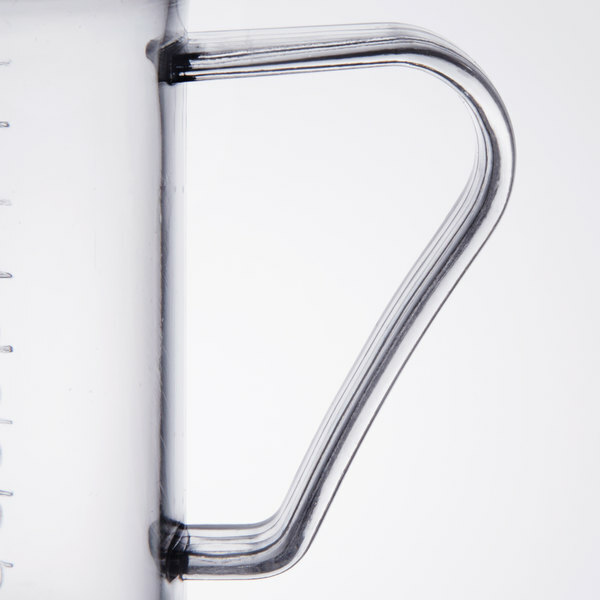 An easy-grip handle also makes pouring simpler than ever before. 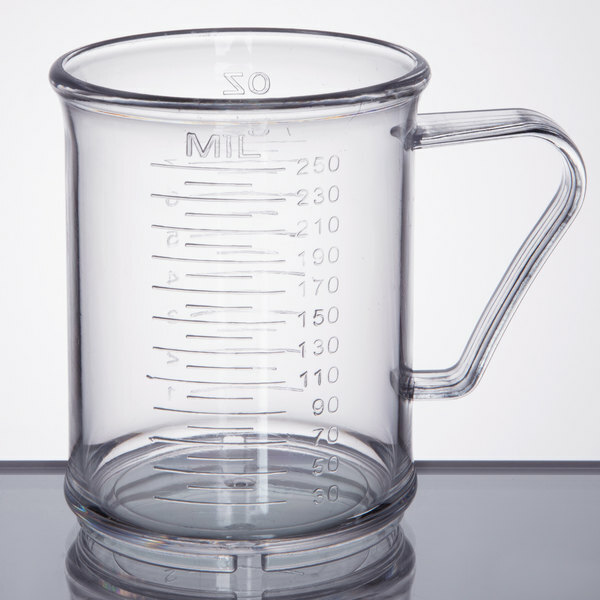 It also includes milliliter and liquid ounce measurements, allowing for simple liquid measurements as well. I’m serving 3 sizes of hot and iced chai tea latte and portion control is important for prfofitability in employee circulation of retail. Have it for your budget. I use this dredge for kosher salt, but it could be used for so much more than that. Being made of a clear acrylic material allows you to easily see how much is left inside the dredge, and there are ounce and ML measurements molded into the dredge as well. It is nice that this dredge comes with three different lids with different sized openings. This is a nice product, but I'm not sure why they cost as much as they do, relative to say larger products made of the same material. It'd also be nice if the measurement markings were colored. Being transparent, I do a lot of squinting to be able to seethe measurements. In the end though, nice and thick, and I don't think it will ever chip or crack. 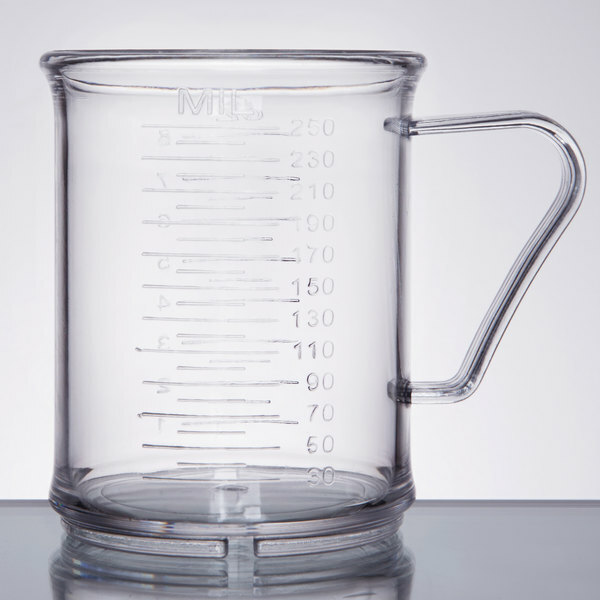 While scales are our go to choice, we like to make sure we have this measuring cup around in case our scales are broken for some reason. It helps get job done when needed. The 8 oz. Acrylic Dredge / Measuring Cup works great for measuring. This is my only shaker that I have with measurements which is very useful in my kitchen. Great quality and price. Highly recommend! This is a nice sturdy shaker that we fill with salt and pepper and sprinkle on sandwiches. The different lids are helpful to adjust the amount of product used. Love these so much! We use them to store salt and pepper so we can easily clean them instead of cardboard boxes that get dirty easily. I wish I had bought one of these sooner. It's so helpful whenever I'm baking and preparing dough. It's made out of a tough plastic that should last a long time. Durable and sleek looking for the modern use! 8oz. is plenty enough space to measure out spices and varying liquid condiments. Easy to wash and re-use with markings clearly labeled. 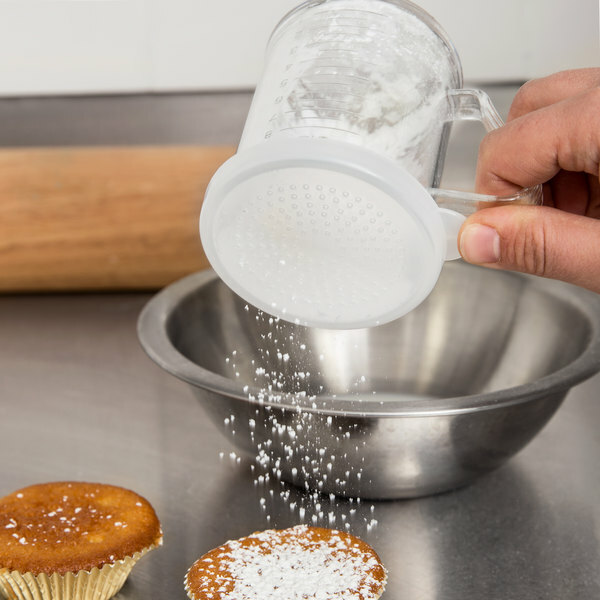 Perfect little measuring cup to toss unto the bag of powdered sugar for measuring it when we make frosting. Easy to clean and holds up good for the price. I love the quality of this acrylic cup. I use it to crack eggs in, to make sure there are no shells before putting into batters. As clear as it is, it's perfect. 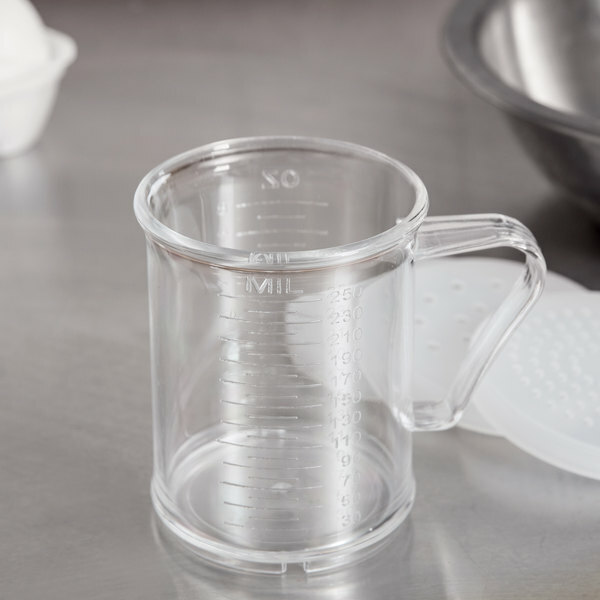 I absolutely love these dredge measuring cup sets. They have measurements going down the side so they can also be used as a measuring cup. Each dredge comes with 3 lids with various sized shaker holes. This thing is awesome! I use mine as a pepper shaker and it works amazing. Can't believe how low the price is too as this is of really good quality. A great shaker. 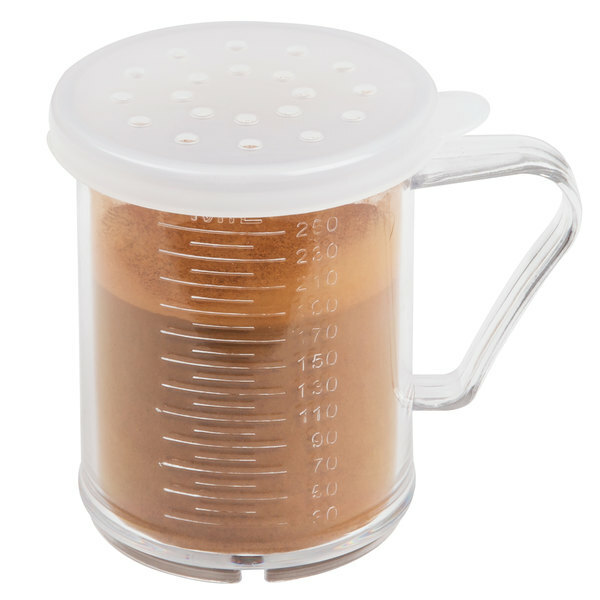 The fact it has three different size shaker tops makes it very versatile. Can be used for almost any dry seasoning blends,. 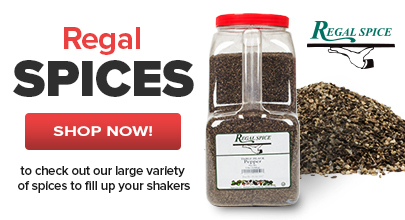 This is a great quality shaker that will shake out any different topping like seeds or seasonings it will last a long time and is made of quality materials. Very helpful for seasoning foods on the grill. We use it for many different types of seasonings. The multiple tops are really handy as they allow a good flow of different kinds of things. This set is great as they give you multiple lids for each of the shakers. Lids easily come on and off. The different holes on the lids make this a must buy. These are sturdy shakers and the lids fit well. With three different sizes for various items that you will be using to shake they can easily be switched out. Quality Item! Great value for the price. Shaker has held up very well even after heavy use in a commercial kitchen environment. Quick refill of product and easy to keep clean. This is a great little shaker. I use it for evenly spreading rubs and seasoning on roasts and jerky. I wish there was a lid with bigger holes, though. Sometimes it is difficult to sprinkly mixes that have larger components to them like crushed peppercorns. 10 oz. Plastic Shaker with Handle and 3 Lids is a great buy. I wasn't expecting anything great out of plastic but I was very happy with how this worked. Sugar, salt, both came out nicely. These shakers were nice for the tables, many wanted more sugar and/or cinnamon and sugar, these were the perfect item. Very easy to fill and use. These are great for use on the line for seasonings. easy to see what is inside of them and holds up well when tossed around without cracking. The three lids can sometimes be a pain or benefit to use because I can switch them around depending on how much I need to pour out. No worries about ordering the right lid for the job because three useful sizes come with each shaker. Since you can see the contents it's easy quickly grab the shaker you need. Perfect for the cornmeal used to prepare pizza peels. You have various seasoniongs then this is what you are looking for. They hold up great and with the various tops you can use them foe everything from FINE salt to Jerk seasoning as well as just parsley. 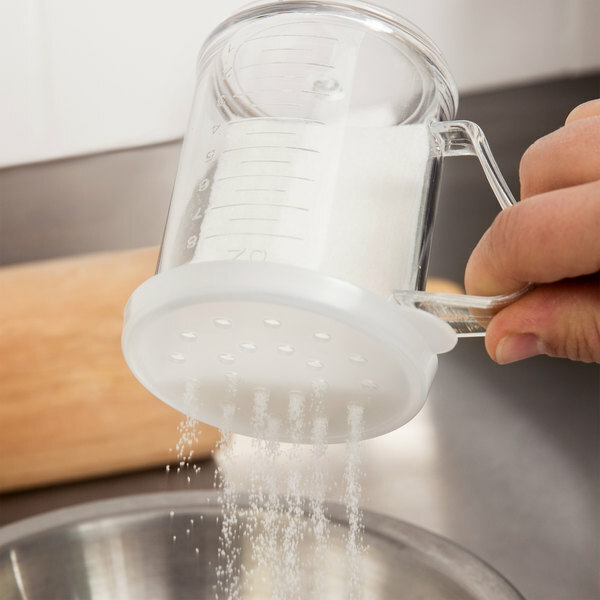 This shaker with lids set is a must have in the kitchen. There are so many uses for it. 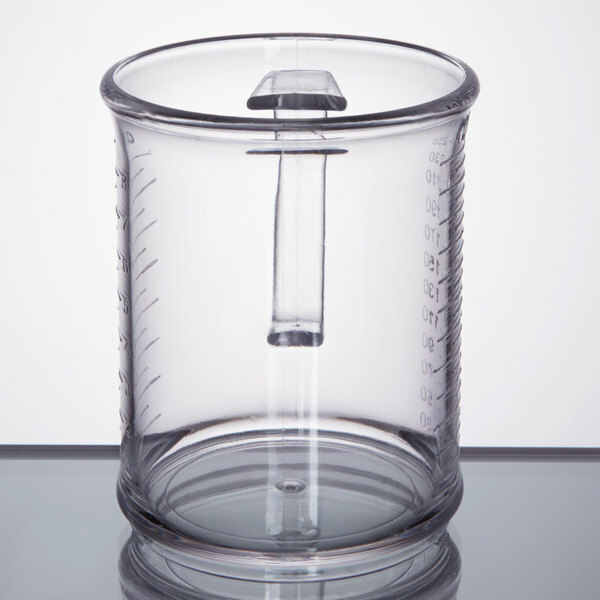 You can use it with out the lid as a measuring cup or with the shaker lid to evenly dispense any number of ingredients. The construction is solid, and we have ordered several for our kitchen. Highly recommended product. This a great shaker. 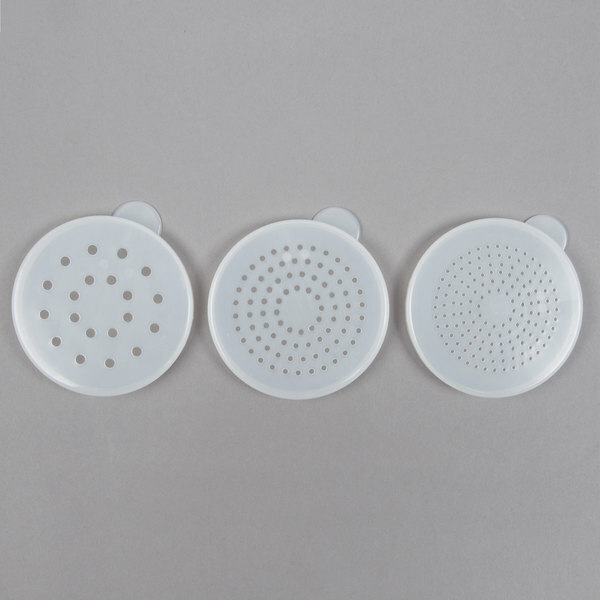 The three lids give you a wide variety of sizes to use for any spices or cheese that might need to be evenly spread. It also has measurements on the shaker which also is helpful.